Earlier this year I tested the PureAudioProject Trio15 TB Neo and came out very impressed and to be honest when it came to be time to part with them I was not exactly happy with the prospects in going back to my own personal early 90s Linn Index IIs. I think the Ze'ev from PureAudioProject sensed this and offered me the possibility of fitting better mid/top drivers and crossovers to transform the Trio 15 TB Neo into the next model up in the range, the Trio 15 Voxativ. The most obvious and visual change is the change from Tang Band Full range drivers to models from German manufacturer Voxativ. This is where the lion's share of the increase in budget goes. To give you an idea the retail on the two drivers I have here is 2000€ a pair! This makes installing them a worrying experience but I managed without any issues (fortunately and in reality of you can do Ikea you can assemble the PureAudioProjects) and connected them up to the newly supplied crossover. Now the crossover is worth a mention as it's a version of a unique design known as the Leonidas. As I thought Leonidas was a manufacturer of Belgian chocolates I did some research to find out what's special. According to the PureAudioProject website the Leonidas operates differently from typicaltwo way crossover topology. The Leonidas Crossover connects the drivers in series allowing them to perform independently in their main frequency range (woofers at the lows and full range at the mid and highs), while playing together and in a perfect phase in the so-called ‘crossover range’. That range and the SPL balancing between the drivers are defined by the values of the components. The inductors act mainly on the woofers, the capacitor mainly the Full Range (or tweeter) and the resistors are responsible mainly for the SPL balance between the two. 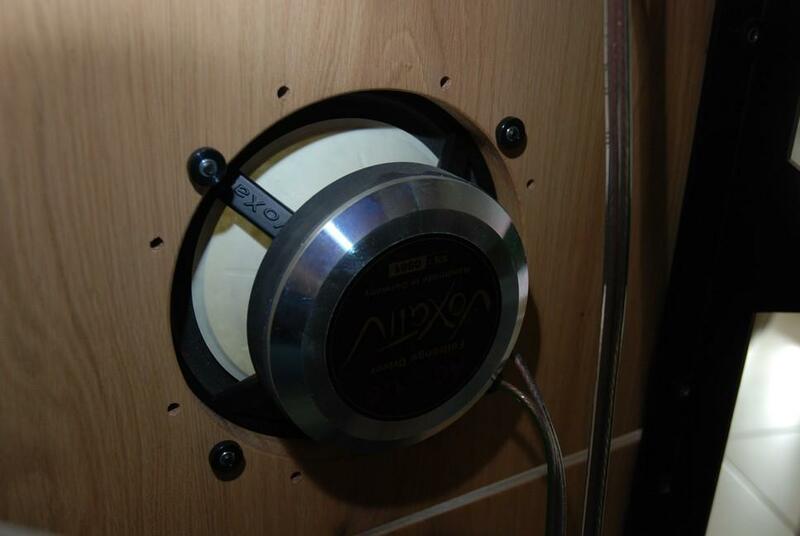 The Leonidas crossover can be bought as a finished product specific to the Voxativs and including a -2dB jumper to help tailor the speakers to your room (the version I have) or a fully modular version where you can change component vaues to get the performance you want or that best suits your drivers. The crossover is also supplied with higher quality cabling between the crossover and speakers further underlining the step up in the PureAudioProject range. 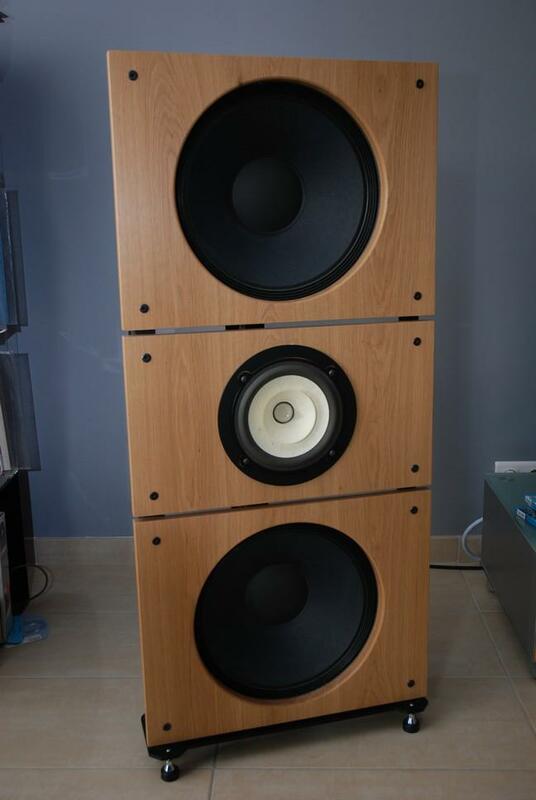 Down in the bass the speakers keep the 15 inch Neo drivers from Eminence and everything is mounted on the same baffles. If you already have the TB version you'll need to drill some new holes for the Voxativs and PureAudio Project supply blanking plates (shown in the picture above) to hide the TB holes which can be seen round the rear in the photo below. I mostly ran the Trios with my usual Canary 608LV amp and Hitachi LC-OFC cabling. Sources varied between a Linn Axis/AO Linn Akito/ Reson Etile or Audio Note IQ3, an Iphone 4 and a Naim CD5i on a daily basis, with a Metronome Technology CD8 and Soulnote amplifier making all too brief appearances for some rapid auditions. Straight away the Voxativ version of the Trios show a marked jump in detail and treble energy. I ended up running them on the -2dB position on the crossovers in my fairly live sounding room - something I didn't feel necessary with the TB version. They have an amazing ability to dig into a mix and often sounds that are in the introduction of a song and which you think dissapear appear at the back of the sound stage as continual chords or synth pads or just noise throughout the track. This was very obvious with Travis' "Sing" played through the Metronome Technologie CD8. The Voxativs also keep the scale of the TBs with instruments sounding real - again it's not a studio monitor type tight placements soundstage but a big instruments of realistic size one which gives the impression you are there rather than that you're watching a tighly mixed film of the band. Vocals are a particular strong point with the Voxativ's. Etienne Daho's "Ouverture" was absolutely spine tingling with the character and inflections in his voice clearly portrayed despite more and more instruments joining in as the song builds up and up. Similarly Cats on Trees "Jimmy" had fabulous vocal clarity, the relatively simple mix allowing every part to be examined separately or as a whole. Despite their increased refinement over the TBs the Voxativs can get down and boogie when required and inspired a friend of ours who shall remain anonymous to a session of air guitar whilst singing along to "Money for Nothing". They were also a surprising success with AC/DC's "Thunderstruck" with the drums having real weight and guitars a powerful top end but avoiding stridance (something I admit I was afraid of when my eldest son insisted on getting this disc out). More dance related music encourages you to do exactly that be it Daft Punk, Gwen Stefani or (yes I admit I did buy the 12") Justin Timberlake's "Can't stop the feeling" which can make sitting down to review things quite hard! The bass performance is on a par with the TB version - there is no trade off for the extra clarity in the upper end. It's fast and as with the TBs with a bit of volume there's all the weight most people would realistically want (or that most rooms can really handle). As mentioned above I briefly tried the Voxativs with the Metronome CD8 and the Soulnote amplifier which is one of PureAudioProject's distributor's favoured matches. The clarity of the Soulnote/Voxativ combination was just amazing - bordering for my tastes on the lean but you could certainly hear what was going on. A switch back to my Canary 608LV restored the balance bringing some valve warmth but without compromising the articulation and clarity provided by the CD8. I would suggest the Soulnote is a fabulous match for the TB version of these speakers but it proved that the Voxativs a) show up any differences in amplifier performance and b) need careful matching to get the best from them. I don't think they will ever be less than very good but a bit of chopping and changing in the amp deprtment will definitely be rewarding (and it's not necessariliy the most expensive amp you will prefer). I would suggest you need to be more careful partnering the Voxativs than the TBs - ultra revealing amps combined with these may be just a bit too much for modern rooms. Get the combination right though and you're definitely onto a winner.